Can I Take Out a Restraining Order on the Elf on the Shelf? To you parents out there who have jumped on the Elf on the Shelf bandwagon, I applaud you, and I enjoy seeing your pictures of the elf’s silly antics on my Facebook newsfeed. However, I am glad my daughter is too little to understand the Elf on the Shelf thing this year. Furthermore, I hope this trend has gone by the wayside by next Christmas. For one thing, this elf kind of creeps me out. His beady eyes peeking out at me from the garland on the mantel make me uncomfortable. Peeping Tom, anyone? 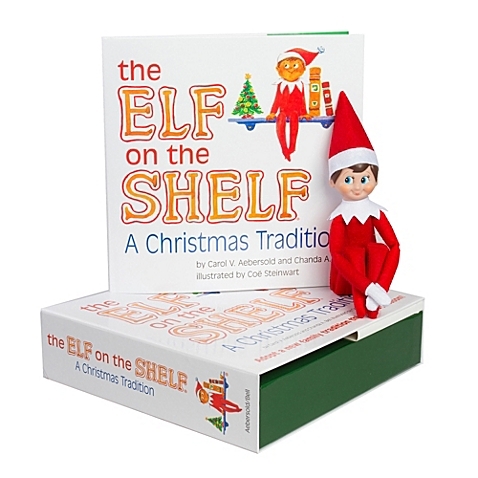 The Elf on the Shelf is the commercialization of Christmas at its finest. The story is the elves show up to watch children for Santa in the days leading up the Christmas. The starter kit retails for approximately $40. Then there are accessories to purchase such as the elf’s letterman jacket and couture T-shirts for the little guy to wear. Plus, during an already busy time of year, parents are now expected to concoct a funny and interesting activity for the elf to be doing every morning when their children awaken. What happened to the value of the idea that “Santa is watching”? Isn’t that enough to encourage good behavior during the holiday season? If you’re having fun with the Elf on the Shelf, I have no judgment. But if you’re stressing yourself out trying to manage yet another holiday expectation, cut yourself some slack and issue the Elf on the Shelf an eviction notice. Yes! I couldn’t agree more. My oldest is 3 and I’ve somehow managed to avoid the trend. Someone said they are thinking about getting one for my kids and I’m secretly dreading it!! I’m so glad I’m not alone. I was a little nervous this post would be met with backlash, but apparently a lot of us have been loathing this elf!